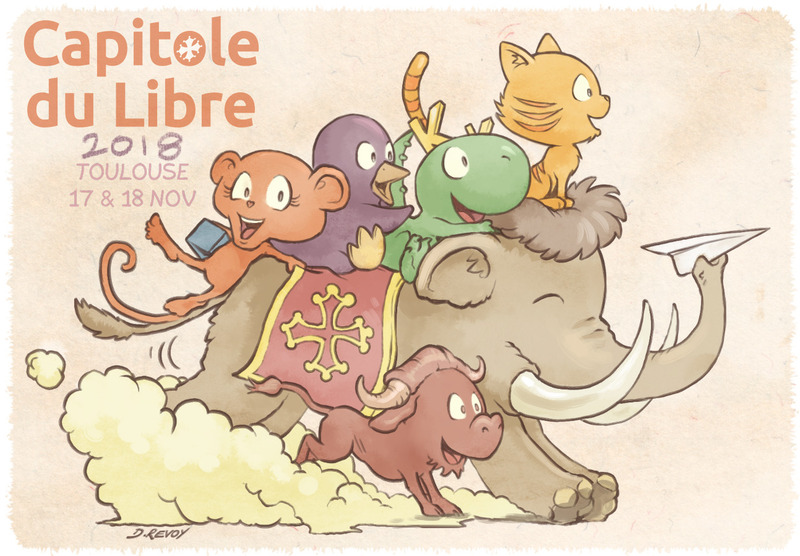 Capitole du Libre in Toulouse (France) is approaching, and it's probably not a surprise if I tell you I'll be attending. It's only 40min away by car from where I live, that helps a lot. This time I'll give a 15min talk (+5min open to questions) about 10 tips to keep 'good health' for a FLOSS project. It will be about communication, website, repository and community. A talk (in French) designed for students of the ENSEEIHT, people who are considering starting a FLOSS project or who already founded a big or small FLOSS project. I'll compress my ten years of contributions from various projects (icons, themes, plugins, presets, bash scripts, open-movies and Pepper&Carrot) to extract from it my experiences and tips. I hope to see many of you around Capitole du Libre and I hope it will be helpful for creators! - Where: Toulouse (France), ENSEEIHT, 2 rue Charles Camichel, 31000 Toulouse. - When: Saturday 17 Nov 2018 between 11h00 to 11h20, B00 building (check the schedule here). PS: About Pepper&Carrot autographs, I didn't organize an official signing session at a dedicated booth this year because I don't have a new book :P but if you catch me and you have a comic book on you, I'll have a pencil with me! ... oh, and artworks for Capitole du Libre 2018 I made are all CC BY and soon will be available on the 'Sources→Misc' of the Pepper&Carrot website. License: CC-BY David Revoy, www.davidrevoy.com, 8 november 2018 .